No, it hasn't rained. 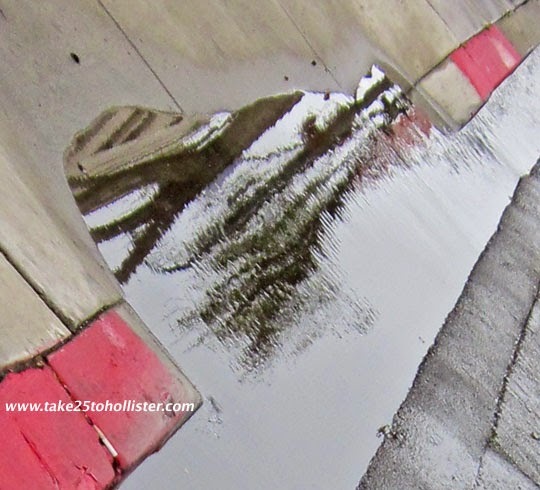 I caught this reflection on San Benito Street during one of the rare showers back in Spring. Just thought it would be nice to see some rain, even if in a photo. Long ago, I read that weather comes in cycles of seven—seven years of heavy rains, seven years of drought, and so on. If that's true, I hope this summer is the worst part of the drought for California and we see rain soon. Let us continue to hope, wish, pray, and dance for rain. Hanging out at Weekend Reflections today. Come join me by clicking here. 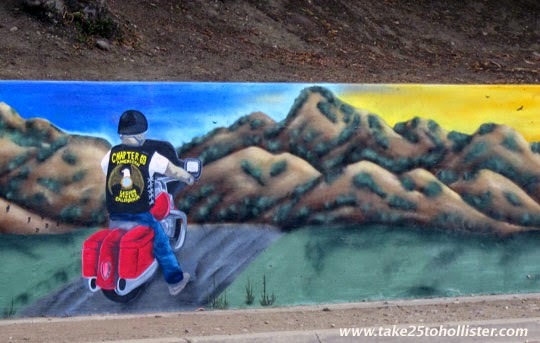 I was back up on Cienega Road, again, enjoying the sights. Hanging out at The Weekend in Black and White. Come join me, by clicking here. 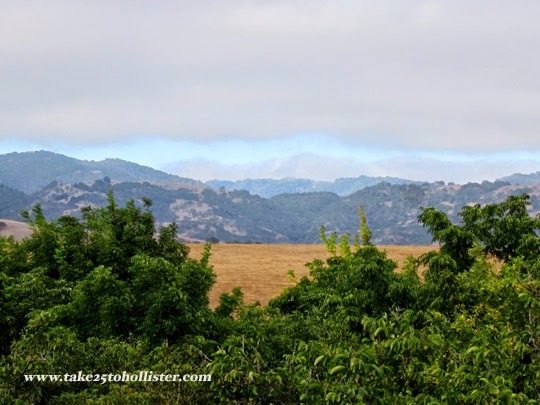 The fog was breaking up over the Gabilan range to the southwest of Hollister. Amazing, huh? It's Skywatch Friday. Click here to check out what the sky looks like in other parts of the world. 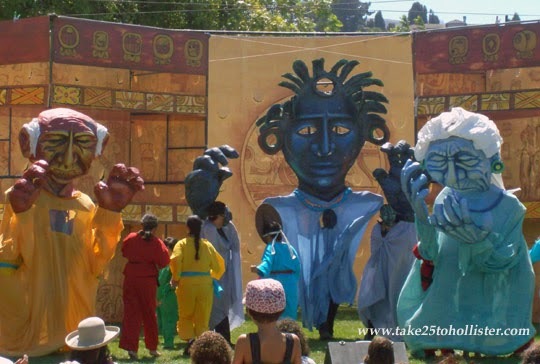 Over the next two weekends, El Teatro Campesiño, of San Juan Bautista, will offer free outdoor performances of Popol Vuh: Heart of Heaven in San Juan Bautista and Hollister. This original play is based on the sacred creation book, Popol Vuh, of the Mayans. It uses large-scale puppets, pageantry, and live music to tell the story of how the creators formed the universe and earth. The play is narrated in English, Spanish, and Qu'iche Mayan. For a detailed description of the play, please click here. On August 30, August 31, and September 1, at 3 PM, Popol Vuh: Heart of Heaven, will be performed at the San Juan Soccer Field in San Juan Bautista. On September 6 and 7, at 3 PM, it will be presented at Dunne Park in Hollister. Remember, it's free! And, it's perfect for children of all ages. Be sure to bring your hats, water, and chairs. Someone once told me that he knew I was a native of California because I described the summer hills as being golden. Not brown. Not yellow. But, golden. Because they are. 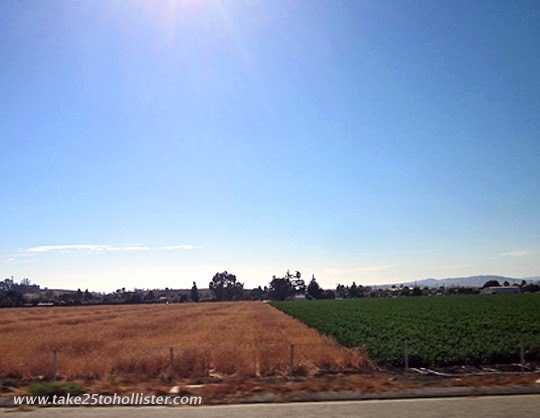 This golden scene is off of Airline Highway, also known as Highway 25, as in Take 25 to Hollister. 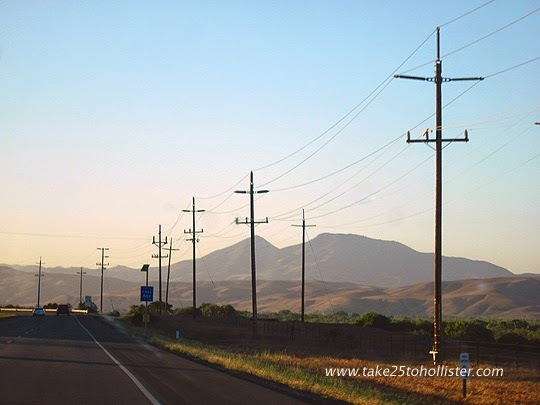 It's just a few miles south of Hollister, in which you'll find none of those Abercrombie & Fitch's Hollister Co. stores. Thank goodness! I'm hanging out at Mrs. Nesbitt's ABC Wednesday. Come join me by clicking here. "When I view Airline Highway on Google Maps, it looks like a country road," I said to the Husband. "It is a country road," the Husband said. "Because it's a two-lane highway?" "Whether it's a state highway or a road meandering through the country side, it's a country road." Yet another Duh! moment for me. I'm so used to the views alongside Airline Highway, also known as California State Highway 25, that when I'm going down it, I don't think of being in the country. I am very fortunate that once I leave my driveway I can go in any direction and I'm out in the countryside within ten minutes. Anyway, the other day I noticed that on the north side of Airline, near Best Road, is a great view of the peaks called the Three Sisters. Those are the small peaks in the far right of the photo. Today, I'm hanging out at Our World Tuesday. Come along with me and see and read about life in other parts of the world. 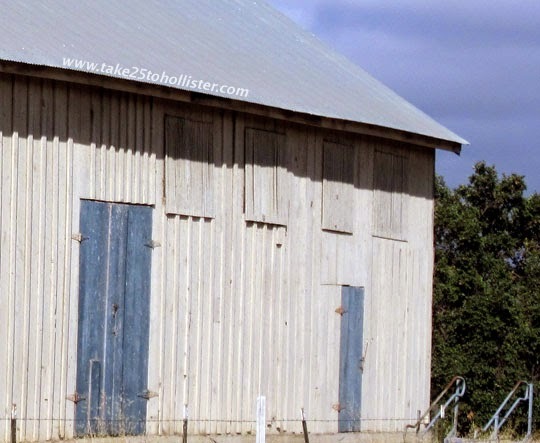 This old unused building stands at the south end of Tres Pinos on Highway 25. I have often wondered whether the building was used by the railroad that ran to Tres Pinos once upon a time. 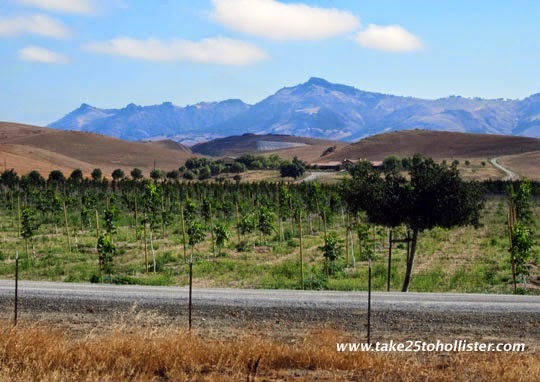 Tres Pinos is the fourth largest community in San Benito County. Population of the unincorporated town was about 476 in 2010, according to the U.S. Census. 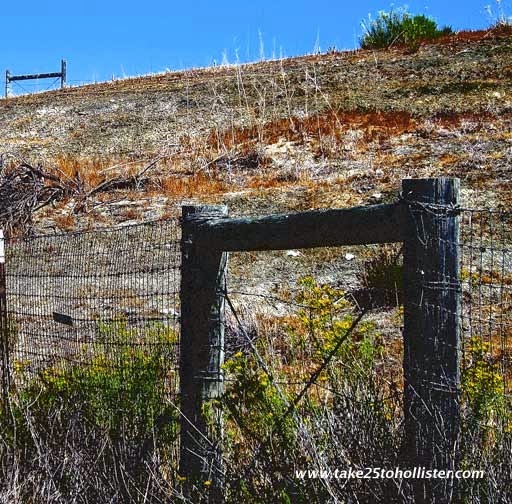 To learn more about Tres Pinos, check out this earlier post that I wrote about the town. Yup, I'm participating in another linky party. Today, it is Blue Monday, hosted by Smiling Sally. Click on the link to check out other posts that feature the color blue. One of the advantages of pedaling a bike on our country roads is the ability to stop at the point where you want to take a picture. Click, click, click. I took this photo on Cienega Road the other day. Because of the drought, I was surprised and glad to see a bit of green and color on the hills. I thought I'd go out of my comfort zone and "art" the photo up in Photoshop. That was a lot of fun to do. Hooking up at Geometric Friday, hosted by LorikArt. We, Hollister folks, love our parades. 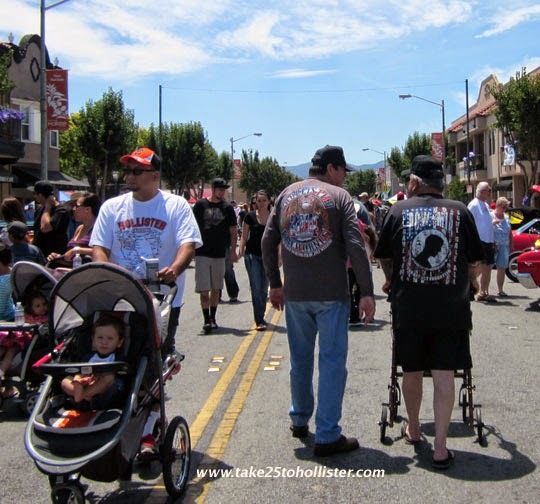 Except for the Fourth of July parade, all of them march through downtown Hollister. Some people set up their chairs on the sidewalk before noon to make sure they get the best parade-watching spots. 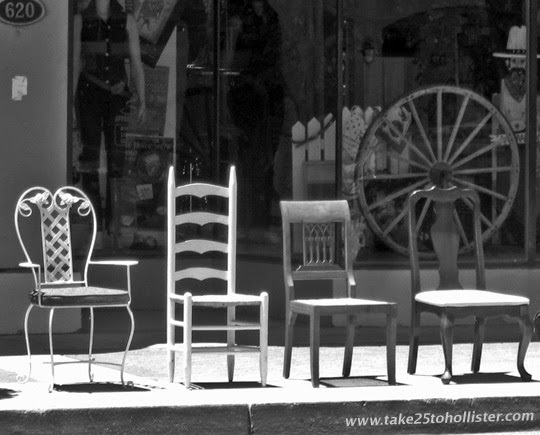 Want to see some stunning black and white photos by photo bloggers from all over the world? Check out The Weekend in Black and White. That's where I'm hooking up today. If Chicken Little saw fog like this seemingly nestled on a hillside, would he have thought the sky had fallen? Today is Skywatch Friday. Want to see what the sky looks like in other parts of the world? 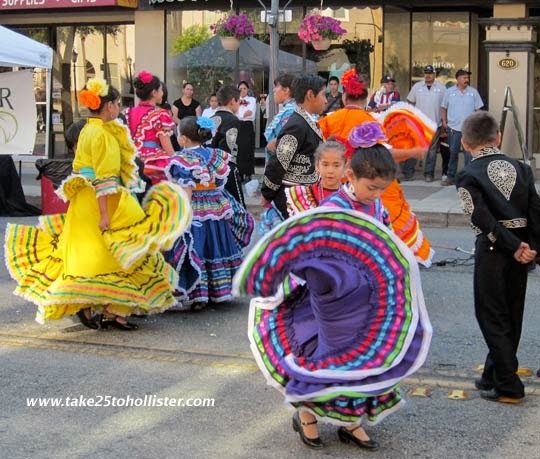 Yesterday afternoon, this group of young dancers performed baile folklorico at the Downtown Hollister Farmers Market. It was certainly fun and enjoyable to watch the children dancing in the street (los niños bailando en el calle). Baile folkorico is a type of Latin American dance that integrates ballet dance techniques with regional folk culture. Here's the Wikipedia link that explains baile folklorico better. Sorry I missed the name of the local dance troupe. Today is Jenny Matlock's Alphabe-Thursday. 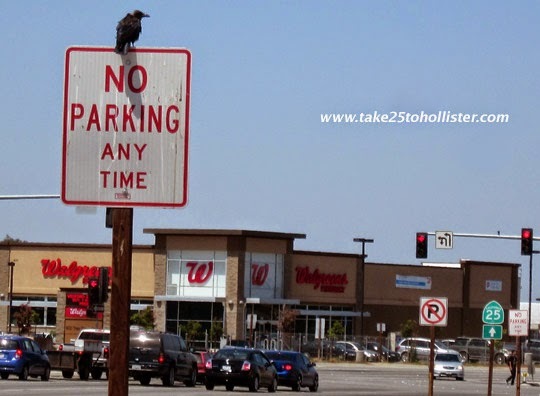 I invite you to come along with me and visit other bloggers who have posted stories and photos around the letter N.
Some of our fine flying friends just think the laws don't apply to them. Hanging out at ABC Wednesday today. Come join me to check out blogs from all over. We're all featuring posts around the letter F.
I forgot to do a follow-up post of the Hollister Airshow that took place a couple months ago. It must've been all that fun in the sun. What I recall most vividly was the parade of the War Birds. 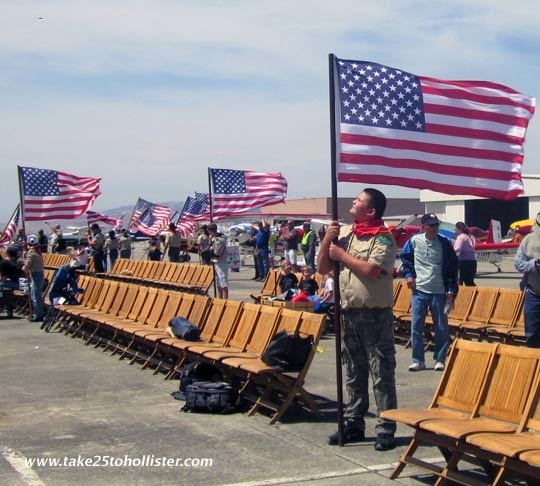 While the local Boy Scout troops stood at attention holding American flags on the tarmac, a B-25 and four fighter planes circled the air several times. As they passed, I couldn't help but think about the type of missions that military pilots completed in these aircraft. I did write an article about the air show for BenitoLink.com, which you can read here, and posted an album at Take 25 to Hollister Facebook page, which you can view here. To learn more about the Hollister Airshow, check out its website and Facebook page. Today, I'm hooking up with Our World Tuesday. 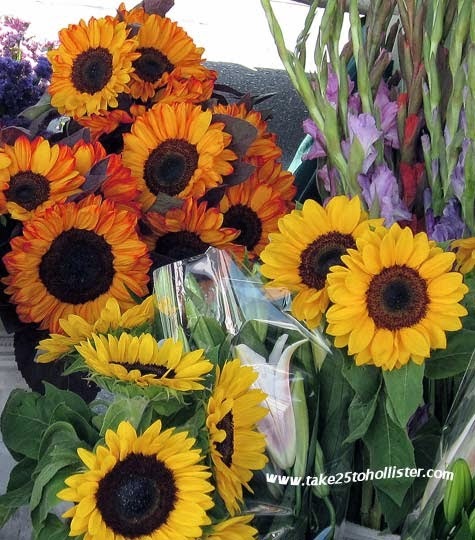 I always love the display of bright colors in the flower vendor booths at farmers' markets. How about you? 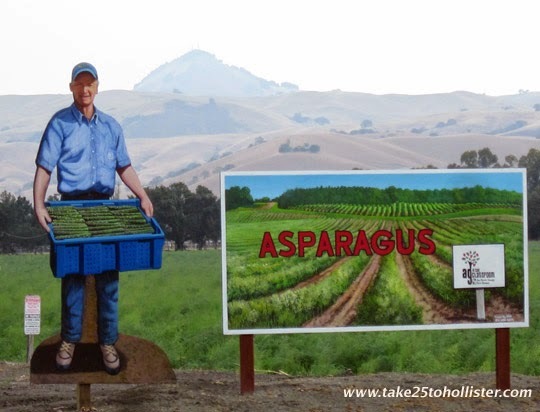 The Downtown Hollister Farmers' Market is every Wednesday, from 3 to 7:30 PM, until September 24, 2014. It's located on San Benito Street, between Fourth and Seventh Streets. I like how the city closes the main street for the market. For more info, check out the market's webpage or Facebook page. 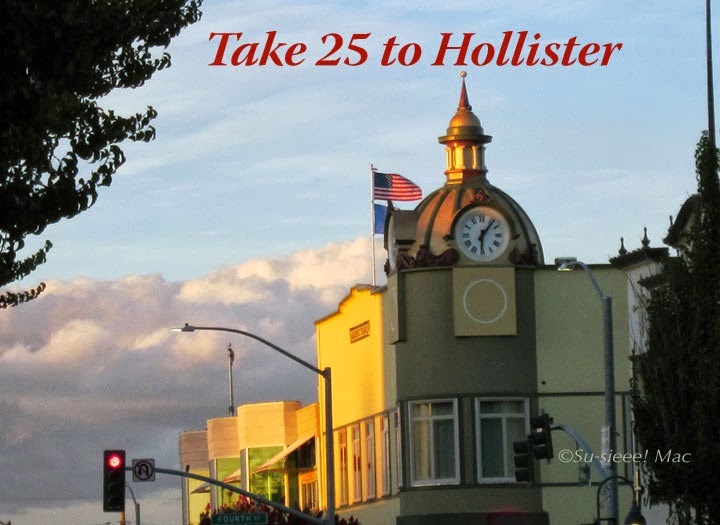 Today, Take 25 to Hollister is hooking up at Monday Mellow Yellows. I've been having fun meeting new bloggers and seeing various parts of the world through a different linky party every day of this past week. Dear readers, I hope you've taken the opportunity to check out some of the links as well. Today, I'm hooking up at Weekend Reflections, which is a site where folks share their photos of reflections caught on surfaces such as windows. 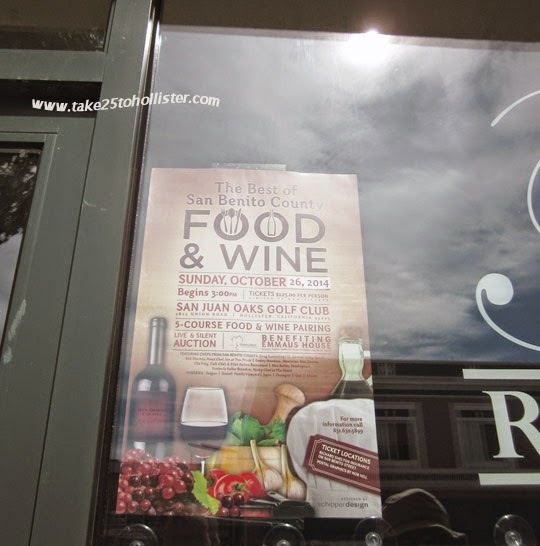 When I took this photo, my focus was on the sign, so as to get information about the upcoming The Best of San Benito County Food & Wine on October 26, 2014, which is a fundraiser for the Emmaus House. Upon finally viewing my photo, I was delighted to see that I caught a reflection of sky and The Vault behind me. Also in the reflection is the Husband's head! One great thing about the deep morning fog we've been having lately is that as the fog heads back west, it cleans out some of the smog, leaving us with a beautiful blue sky for part of the day. I took this photo at the corner of Sixth and San Benito Streets on a stroll through downtown last Sunday with the Husband and an out-of-town friend after lunch at La Villa de Jerez. Part of our walk included stops at Bill's Bullpen Baseball Cards & Comics and San Benito Bene. Does it sound like I'm name dropping? Good. 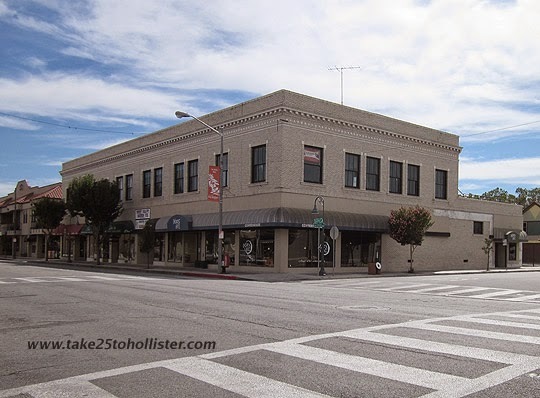 Just want to let you know that a few shops are open in downtown Hollister on a Sunday afternoon. Today, I'm participating in Skywatch Friday. 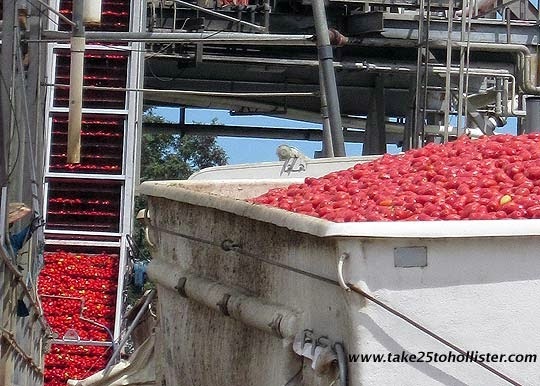 To see photos from bloggers all over the world, please click here. 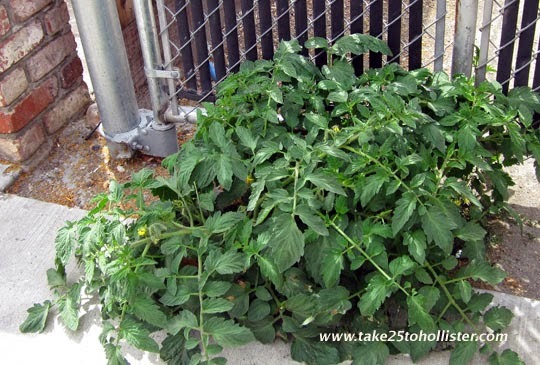 This lone volunteer tomato plant is growing up through the sidewalk on East Street, right next to the tomato cannery. Ha! 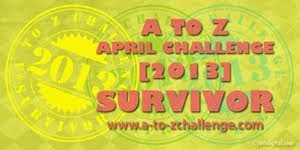 I'm taking part in ABC Wednesday. This week is the letter "E" as in East Street. On Sunday afternoon, the Husband and I took an out-of-town friend on a drive down some of the country lanes in our county. 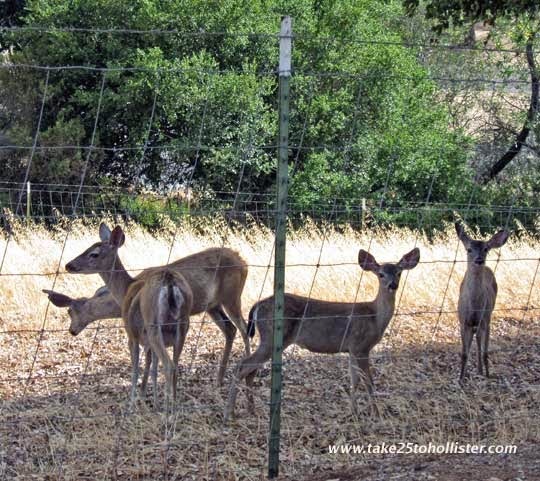 On Comstock Road, we came across a bunch of deer hanging out at the end of the road. 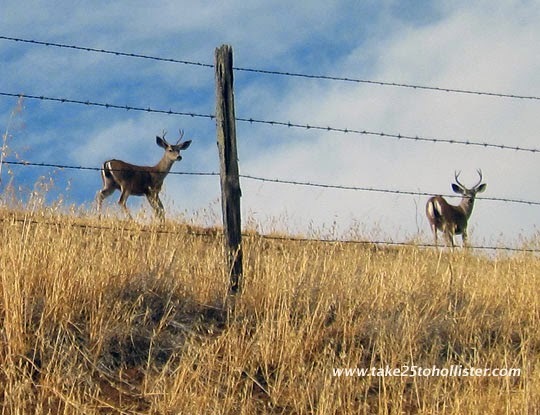 Interestingly, the three males standing on the road were separated from the four females by a wire fence. The females were grazing on the grass. It looked like the males were saying to them, "You've got it going on." As we drove closer, two males ran across the street and up the hill, while the third jumped the fence and nonchalantly walked pass the females. The ladies? They stood their ground, munching away at the grass as they kept an eye on us. Today, I'm hooking up with Our World Tuesday. Click on the link to check out photos and posts from other parts of the world. 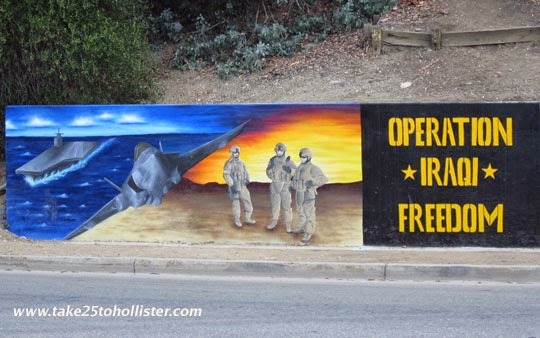 Last month, artist Philip Ray Orabuena and his friends painted a mural dedicated to the Veterans of the Iraqi and Afghanistan wars on the retaining wall at the bottom of Park Hill on Third Street. 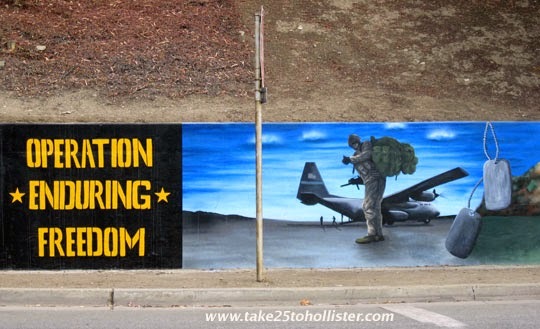 Check out their story at BenitoLink: "Veterans' Mural Makes a Statement" and at San Benito County Today: "Painting the Town Patriotic Through Mural". Below are close-ups of the 105-foot long mural. Before you take a look, I'd like you know that I'm hooking up this post at Monday Murals. 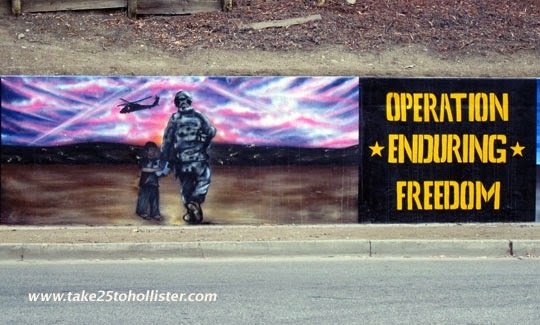 If you'd like to see murals from other parts of the U.S. and the world, click over to this link after checking the close-ups of the Veterans' Mural. 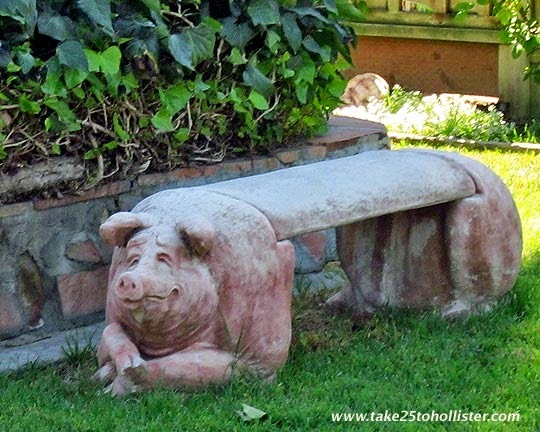 A bench of a pig, that is. 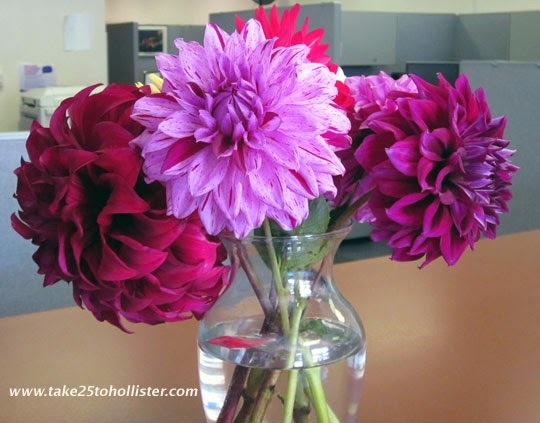 Have a great easy-going Sunday, dear Take 25 to Hollister readers. Tomorrow, August 10, 2014, will be the 50th annual Antique and Collectibles Fair in San Juan Bautista. Sellers from all over will offer antiques, collectibles, and memorabilia that were produced before 1975. The event will run from 8 AM to 4 PM. Admission will be free. Steve Yvaska, antiques appraiser and San Jose Mercury columnist of "The Seasoned Collector" will offer free appraisals from 10 AM to 2 PM in front of the Union Bank Building, at Third and Mariposa Streets. Folks may bring one or two items for him to evaluate. The outdoor Antique and Collectibles Fair, a fundraising event, is sponsored by the Rotary Club of San Juan Bautista. I came across another gorgeous sign by the Ag in Classroom project, sponsored by the San Benito County Farm Bureau. The sign is located on Fallon Road. Want to see a few other signs done by this project? Check out this link. They're sitting on the counter at the PG&E office on East Street. The ladies in the office told the Husband and me that a customer comes in regularly with flowers that he grows to give them. I love stories like that. Don't you? 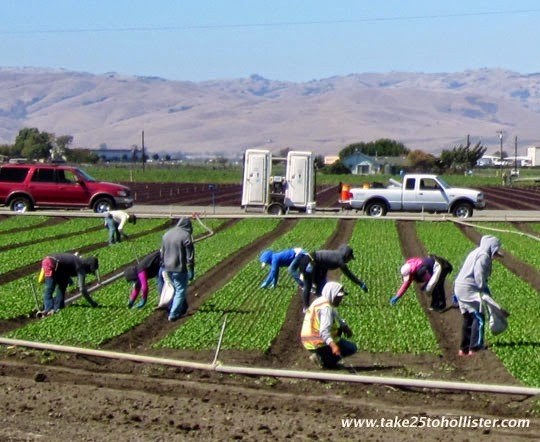 Farm work is back breaking intensive labor. I appreciate the men and women who are willing to do these jobs. Day in, day out, regardless of the weather. These days, I don't see too many young folks walking around in tee-shirts or sweatshirts sporting the name of the fictional beach town called Hollister. 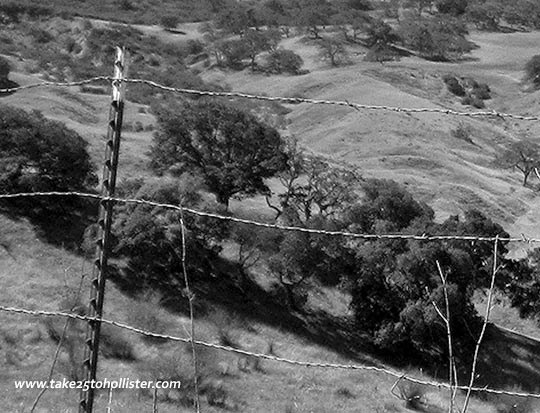 But, then, I hardly get out of our town of Hollister. I have seen people now and then around town wearing tops celebrating our Hollister. That, I like. 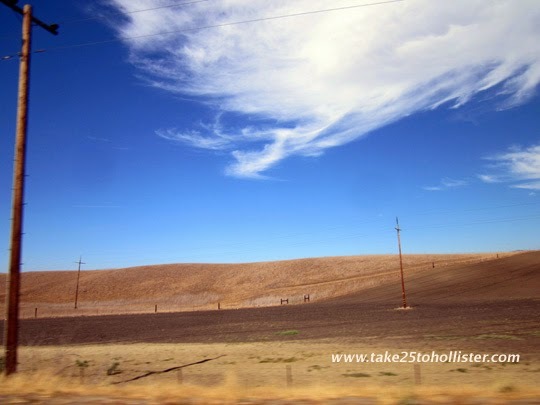 For today's blast of Take 25 to Hollister past, I give you Hollister versus Hollister, a post that I wrote on March 21, 2010. I have yet to find an alley in Hollister that dead ends at a brick wall on all sides. You know, like in the movies. Nor, for that matter, an alley with a tumble down or rickety fence to climb up and over to run away from the "bad guys". As some of you, dear readers, know, the Husband and I like sidetracking through an alley when we suddenly come upon one whether walking, bicycling, or driving. 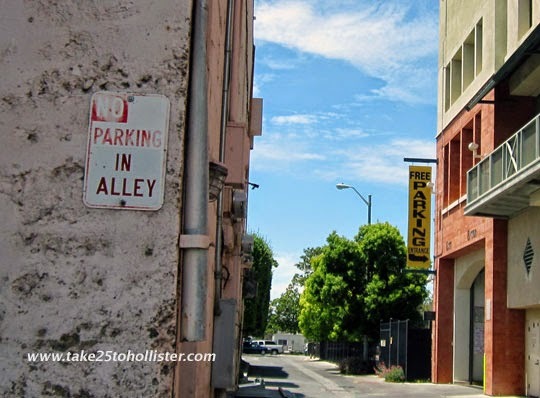 There are 18 alleys, according to the Google map of downtown Hollister. 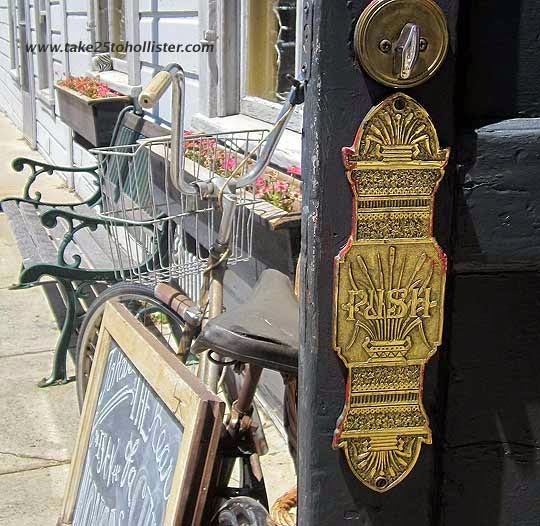 For past posts about some alleys, check out this link: Alleys. 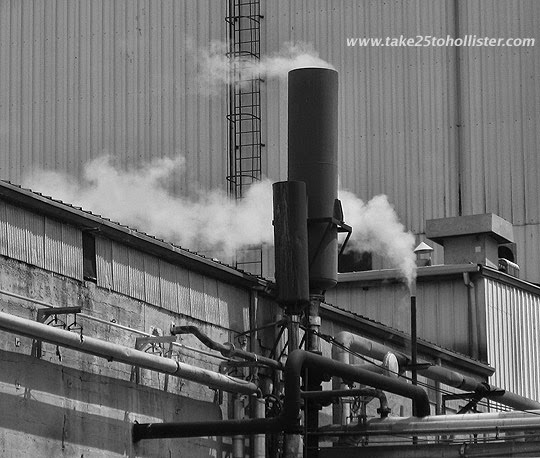 This coming Wednesday will be post #1,001 for Take 25 to Hollister. Yup, I'm amazed, too. I didn't think I'd ever last this long. So, for the next three days, I shall link back to a past post. 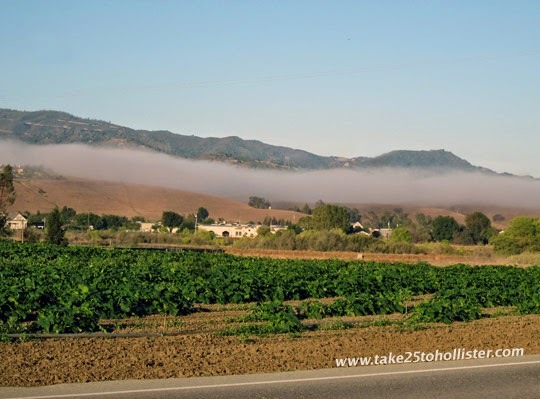 The Husband and I have driven out of town via the Bolsa, aka Highway 25, the last couple of weeks, so I shall take you back to the post that I published on October 14, 2008: The 25, The Bolsa—Same Difference. 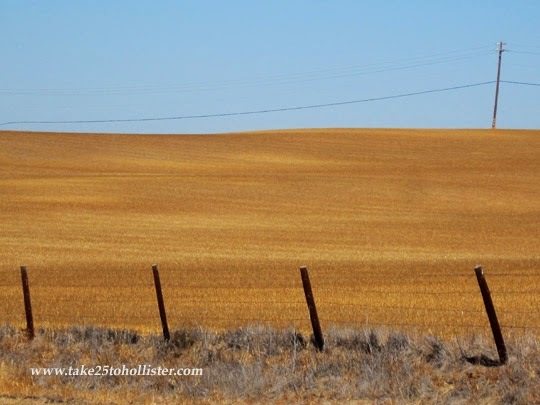 As we go through this drought, some farmers will allow their fields to lay fallow and some homeowners will let their lawns go brown or die completely. It's only common sense. Yesterday, August 1, the emergency state regulation to restrict water use in California went into effect for 270 days. 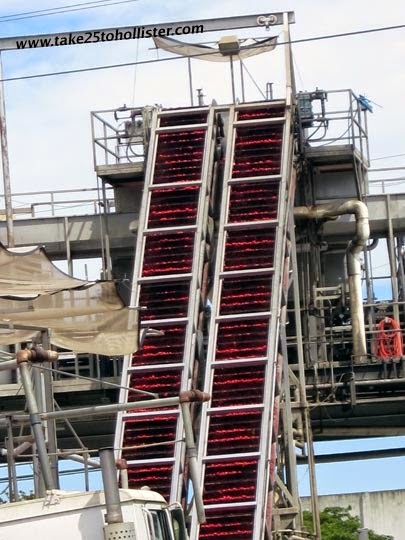 To learn more about what that means for residents of San Benito County, read the article, "State Water-use Rules Allows $500 Fines" by Adam Breen at BenitoLink.com.